Sixty-five years ago, when Capform Inc. founder Mario Dozzo applied to emigrate from Italy, he told the Italian consulate that he wanted to get as far away as possible; they handed him tickets for Vancouver, Canada. Dozzo spent weeks traveling to Spain, crossing the Atlantic by boat and traveling through Canada by train. When he got as far as Toronto, he took in his surroundings, saw buildings going up high in the sky, and instantly knew what he was destined to do: build. Dozzo settled in Toronto, established business connections and, with them, launched a construction business. When Toronto faced an economic downturn, the partners “decided to cast a wider net for greener pastures,” and Dozzo found himself moving again, this time to Texas. The company has been based in Dallas, Texas, since 1978 and has completed nearly 1,000 projects. While this legacy makes for an interesting story, it also gives the company a few advantages. “What I’m most proud of with Capform is the tenure and quality of our people,” says David Dozzo—Mario Dozzo’s son and the company’s principal. Many of the original crew who relocated with Mario Dozzo from Canada remain at the company. Among the longtime employees are Capform’s CEO Luc LaFleur, Vice President Tony Bellissimo and General Superintendent Luigi Schieda. And Capform’s receptionist, Cindy Broussard, has been with the company for 30 years. Whenever possible, Capform hires managers who have field experience. Dozzo himself worked in the field for years, honed his skills as a carpenter and then took on project management, contracts management and estimating roles. He didn’t assume a management role at Capform until 2006. Long-tenured and experienced staff, like Capform’s licensed structural engineer, who has been with the company for 20 years, and LaFleur, who has been with the company for 46 years, provide vital insight into building strengths and load-bearing tolerances. Capform is often able to show engineers how, through value-engineering, they can reduce the amount of reshoring—the multiple levels of shores placed below the story being cast with concrete in order to distribute the construction loads—needed later on. Due to less shoring being installed, the timelines are typically shortened. Dozzo is proud of each department, including production, engineering and human resources. The safety department has become especially effective, he says. The company’s official motto is “Team Capform – Nobody Gets Hurt,” and each region has a dedicated safety training center where new hires receive hands-on training. The 2.4-million-square-foot hospital is the largest public hospital building in the nation. 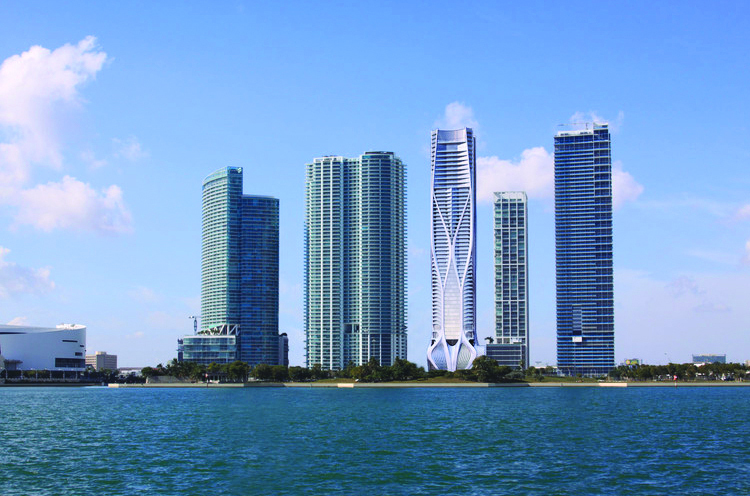 Its design included a 120-foot span and a 60-foot cantilever, soaring 10 stories. Those required a 30-foot-deep post-tension structural member to carry the load. Other projects, like the Hunt Corporate Headquarters and One Thousand Museum, further demonstrate the complexity Capform can handle. The 14-story Hunt Headquarters building in Dallas has a continuous radial column from bottom to top, which Capform had to adjust for, and One Thousand Museum—a 62-story residential condominium tower in Miami—has a curving concrete exoskeleton that offers aesthetic appeal and reduces the number of interior columns required. Projects like these often earn Capform repeat customers. Through the general contractor, Manhattan Construction Co., Capform contributed to the Dallas Cowboys Stadium in 2007 and the team’s headquarter offices and practice facility, which were completed in 2015. “We very much appreciate that the service industry isn’t the only thing that relies on repeat customers, so we do everything we can to adhere to schedules, give [customers] quality, give it to them on time, and hopefully they’ll look to us again,” Dozzo says. In addition to having a knack for complex structures and tenured staff, Capform has another advantage: its 20-plus acre equipment yard where it has the capability to fabricate and refurbish equipment. As construction booms in Dallas, more companies are coming from out of town in search of business. Unlike Capform, they have an insufficient amount of equipment, sometimes rental equipment, and a limited crew. “With 20 acres full of equipment, it gives us a lot better leg to stand on and a lot better comfort for our customers. We have the resources that our competition doesn’t,” Dozzo says. With offices in Dallas, Carrollton and Austin, Texas, as well as Tampa and Miami, Florida, Capform is well-positioned to serve the Gulf States. In the event business does slow down in Dallas, the company is not opposed to travel.